Chocolate & Zucchini :: View topic - I <3 this! Posted: Mon Nov 26, 2007 4:13 pm Post subject: I <3 this! 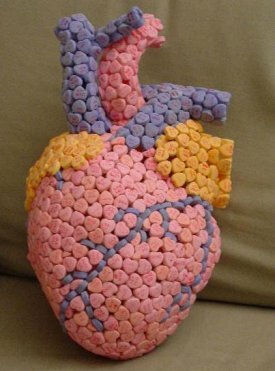 Here's your anatomical food moment for today: a replica of the human heart made from candy "conversation" hearts. I love me a little skill and ambition in the service of some silliness and imagination! Eating that would probably cause your heart to stop. Haha...you would instantly become diabetic after eating that! I wonder how long that took to make, did you make it? Candy makes for good decorations tho, especially for the Christmas tree. No. Alas! I'm not that clever and I'm far too literal. Okay, okay, I get it. Finally. The candy heart is clever, but I (as a non-computer speak/non-messaging dinosaur) have spent the past week trying to figure out why this post title is "I Less Than 3 This". Am I the only one?? It takes me a while sometimes, but I usually get it. The ruination of grammar and spelling but the rise of a .. brave new world! Right! I guess you have to live with someone whose life is about text messaging to stay current. No, No, No. No apologies necessary from anyone. Besides, it's good to laugh at your own limitations occasionally. Besides, Gingerpale, you are at least aware of "Leet Speak" and Rainey, apparently, knows everything, so I am in respectful awe. I stopped teaching (university undergrad composition) a few years ago when I started to feel that my students and I were operating in parallel universes. While I have missed the students and missed the classroom (but never the paperwork), I continue to feel that I would be out of step with certain essential elements of the(ir) functioning world. "Leet Speak" only confirms this for me. I'd rather spend my time taking another class to reinforce my meager French vocabulary and one tense (present) than to attempt to conquer a vocabulary made for machines. How clever! Thanks once again Rainey for another interesting post. You always find these great little gems. I had no idea what that subject heading meant. I don't have a mobile phone, couldn't send an SMS if my life depended on it and still type (and speak!) in full, punctuated sentences. I thought the same as you, Georgia. Oooh! I get it! Took me a while but I get it! I was sitting here trying to work out the title not being completely up with todays phone text writing. Thanks for the explanation Karen. Great looking heart. That would have taken some doing.